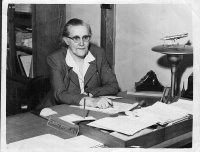 Florence De Launey Buford was a principal at Clark Elementary School in Charlottesville from 1931 until her retirement in 1964. Buford Middle School is named for her. ↑ Web. Belmont - A History of a Neighborhood, James H. Buck Jr., Paper for James Kinard's Local History course, May 1980, retrieved June 30, 2014. ↑ Web. Miss Florence Buford Tells League About City Schools, Staff Reports, Daily Progress Digitized Microfilm, Lindsay family, March 25, 1948, retrieved December 23, 2016 from University of Virginia Library. Print. March 25, 1948 page 5. This page was last edited on 23 December 2016, at 09:12.